Chiang Mai is truly the Gateway to the North of Thailand and all that is peaceful - yet breathtaking! Chiang Mai City is the Second largest City in Thailand. Chiang Mai Province is the first choice for many visitors and settlers alike. It has everything for both, and more than enough to keep the visitor busy - in a relaxed way - for a few weeks. Get away from the main tourist areas. Hire a car - driving is not too bad here. drivers actually wait at traffic lights and are happy to let you out of side turnings. Pattaya it is not. Some of the most stunning landscapes and terrain are to be found in Chiang Mai province, together with incredible temples - some 300 or so! many are within the area classed as the city, but some of the more spectacular ones are a short trip outside. Together with this, the area of Chiang Mai is awash with traditional handicrafts - and the centre of the city is host to Thailand's largest handicraft market and bazaar. There are countless shops, but it is the night bazaar and walking street that are the main attractions for the handicraft hunter. If you want something a little larger, then there are numerous small operations making wood furniture and the most amazing wood carvings. These can range in size (and price) from key ring attachments to huge ornate carvings that would literally nee a truck for movement! There is a very interesting self-guided tour available to an area where all this takes place. Countless markets, Zoos, Elephant treks, waterfalls, forests, mountains, restaurants, food, arboretum, national parks, monuments, temples, people, caves, jungles, arts and crafts, hire a mountain bike, hill tribes, white water rafting, river cruises, golf, rock climbing, spas, shopping. This then, is Chiang Mai. The Chiang Mai night life includes, but is not confined to, Pubs, Restaurants, Music - western and Thai, Discos, Karaoke, BBQs to die for, People! The Thai pub - enormous - is not the place to go for a quiet chat and drink. here are various festivals throughout the year in Chiang Mai - including flower festivals and of course the umbrella festival, lanterns, beauty, fireworks, religious festivals. You may also wish to spend time learning one of the traditional Thai sports/activities such as Thai Boxing, Thai Massage or even Thai cooking. Doi Inthanon National Park - Home to the highest mountain in Thailand at 2565 metres above sea level. Chiang Mai is a very popular area for those wishing to retire to an area of beauty, cooler temperatures, lower cost of living, peaceful surroundings, the food. In excess of 5,000 ex-pats have made that decision already. The province of Chiang Mai is around 700 km north of Bangkok, 300m above sea level and is surrounded by mountain ranges. It is also home the the highest mountain in Thailand - Doi Inthanon. Chiang Mai's reputation as an area of natural beauty is highlighted by the fact that it has several national parks within easy reach and access. 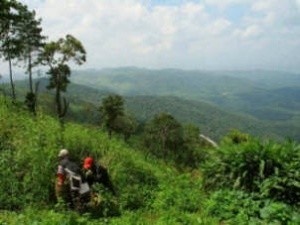 The mountains are generally jungle with plenty of wildlife and plant life for visitors and 'explorers'! Top the North, there are the famous, enigmatic 'Hill Tribes'. It is possible to visit the high hills to the hill tribe villages. The city of Chiang Mai dates back to c 1296. It was then capital city of the Lanna kingdom and seen as the centre of Buddhism in N. Thailand. The many temples in the area are testimony to this. November - February is a good time for western tourists. Temperatures are at their lowest at this time, with a day temperature of around 28C and nights 15C. In the higher parts, the temperature can drop considerably lower at night. T shirts are not advisable! March to May are considerably hotter, with day temperatures of 35C+ not uncommon in Chiang Mai city itself. Cooler in the suburbs, but still hot! Rain! The rainy season in Northern Thailand is June - October.